Pixar Fest is coming to Disneyland Resort, April 13 through September 3, and I can’t wait! This first-ever celebration of friendship and beyond brings favorite Pixar stories and characters together for a limited time with special parades, fireworks and more throughout the Disneyland Resort. What’s even better is that there are some amazing dining packages available that can make your Pixar Fest experience one to remember, and I’m here to give you all of the tasty details! Ladies and gentlemen, boys and girls: A spectacular nighttime pageant of magic and imagination awaits you, with special dining packages for the “Paint the Night” parade! That’s right – this legendary parade is coming to Disney California Adventure park for Pixar Fest starting April 13, and reservations are now open for the “Paint the Night” Parade Dining Packages. With these packages, you can embark on a culinary adventure highlighted by one of the biggest and brightest parades in Disneyland Resort history. Start your journey with a mouthwatering feast from your choice of two popular Disney California Adventure park restaurants. Step into a Golden-Era movie palace where premier cuisine takes “centerscreen” at Carthay Circle Restaurant or experience Napa Valley’s passion for wine and fresh fare in an idyllic Mediterranean setting at Wine Country Trattoria. And at the end of your meal, you’ll receive vouchers that will give you entrance to special viewing areas where you can enjoy the spectacular sights of “Paint the Night” parade as it makes its way through the park. At Wine Country Trattoria, prepare to be transported to the heart of Napa Valley as you savor a three-course culinary experience with flavors of California and the Mediterranean. Start of the evening with Italian Insalata with pepperocinis, Kalamata olives, Roma tomatoes, cucumbers, shaved parmesan and a red wine vinaigrette or the Chef’s Soup Selection – Italian Wedding Soup. Then enjoy the main course with selections such as Spaghetti Aglio e Olio with seasonal vegetables, arugula, tomatoes, garlic, chili flakes, Tuscan Salad, Linguine alle Vongole or Fettuccine Shrimp Alfredo. And finally, top off the meal with a decadent dessert of either Trattoria Tiramisù or Chocolate Panna Cotta! At Carthay Circle Restaurant, dine in style with a four-course meal as you take in the elegance and glamour of Hollywood’s Golden Age. For the first course, experience a delicious Crab Custard with chilled asparagus, and then move to the second course with a savory Soup of Roasted Parsnip accented with Winter Pears, Dried Cranberries and Rosemary Ham. For the main course – choose between the Sustainable Fish of the Day with Spanish chorizo, Bay shrimp and red bell pepper romesco, or Stone Creek Prime New York Steak with winter root whipped potatoes and Cabernet Essence. And finally – for dessert you can enjoy the sweet Painter’s Palette! Ignite the night with tasty treats, libations, reserved viewing and a serving of Disney magic with the Sonoma Terrace “Paint the Night” Parade Reception. If you’re looking to end your night on a deliciously dazzling note, then this unforgettable evening is for you! 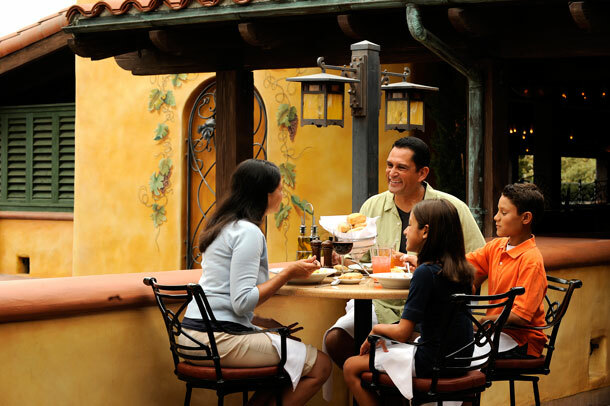 This dining experience welcomes kids of all ages to experience “Paint the Night” parade from reserved seating in the beautiful Sonoma Terrace. At the event, you can help yourself to charcuterie and desserts served with wine, beer and other non-alcoholic beverages. You’ll even receive a box of tasty truffles to enjoy later! In Disneyland park, experience Pixar Fest by dining at Plaza Inn before enjoying Pixar Play Parade, debuting April 13. 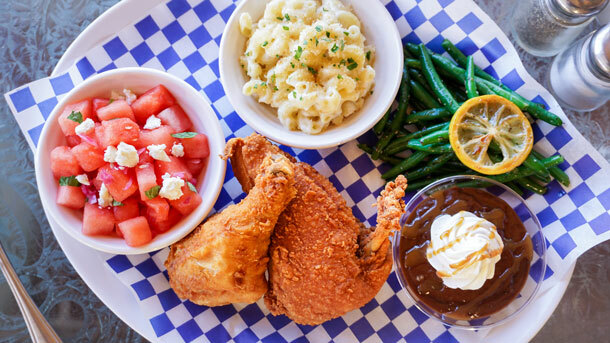 Here you can savor a delicious picnic-inspired meal with a chicken breast and leg, white cheddar macaroni and cheese, lemon green beans, watermelon salad, pudding dessert and your choice of beverage. The kid’s meal will include chicken tenders, choice of side, fruit, pudding dessert and your choice of beverage. In addition, vegetarian options are available upon request. When you book this dining package, you will also receive Disney FASTPASS for special reserved viewing areas for Pixar Play Parade, where you’ll discover some of your favorite Pixar pals from “Up,” “Inside Out” with brand-new story elements. Reservations for this dining package will open early March, so stay tuned for more info!